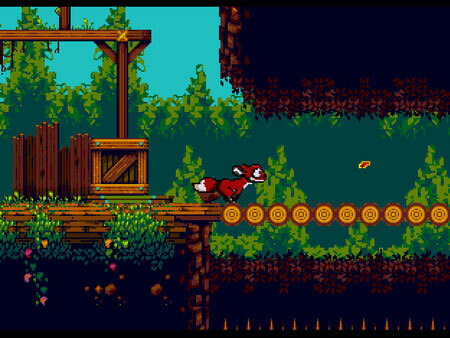 Tanglewood is a brand new and original puzzle-platforming game from Big Evil Corporation. It is a true 16-bit, challenging platforming experience that will make fans of the golden gaming era feel warm and fuzzy. The game is set in a fictional world. You will play as a young creature named Nymn, who is separated from home after the twin suns set. Unable to get back to safety, Nymn must find a way to survive the night terrors and make it to morning. Tanglewood’s world is a dangerous one after dark, and Nymn must use skills of evasion, special abilities, traps and trickery to defeat predators. The game features collectables, achievements, secrets, puzzles, special abilities, tricks, and traps. There are 28 challenging levels spanning 8 story chapters in the game. Enjoy lovingly crafted characters, original soundtrack, and fluid animations. If you get stuck in the game, check out the video walkthrough and gameplay for the game. This entry was posted in PC Games, Walkthrough and tagged Tanglewood Achievements, Tanglewood Cheats, Tanglewood Collectables, Tanglewood Game, Tanglewood Gameplay, Tanglewood Guide, Tanglewood Hints, Tanglewood Puzzles, Tanglewood Review, Tanglewood Secrets, Tanglewood Solutions, Tanglewood Special Abilities, Tanglewood Strategy, Tanglewood Tips, Tanglewood Traps, Tanglewood Tricks, Tanglewood Walkthrough by Marvin. Bookmark the permalink.